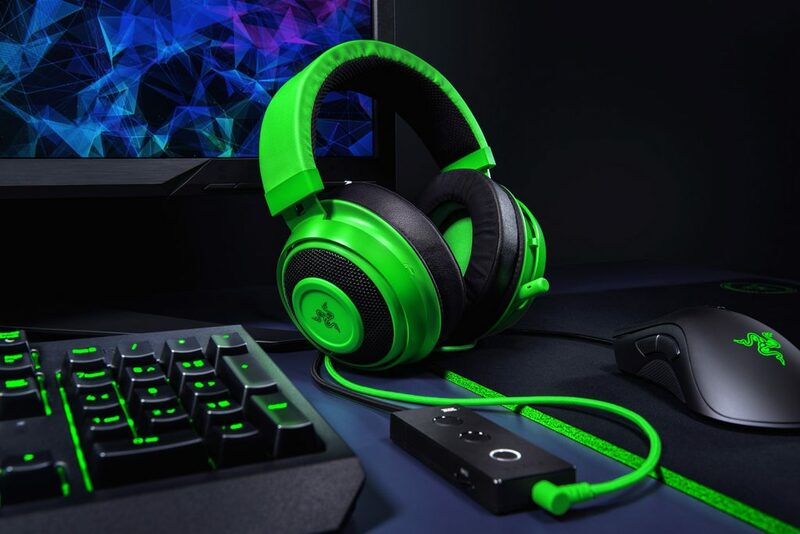 While Razer’s previous Kraken headset, the Kraken Pro V2 was billed as the ‘headset for Esports pros’, their latest offering aims to up the ante substantially, both in functionality and in design. Style is certainly something Razer continues to nail in their products, and it’s the first thing that strikes you about the new Razer Kraken Tournament Edition, especially its flagship neon green variation. The colour screams out ‘Razer’, sure, but the huge meshed cups with extra padding and attractively wrapped headband make it look like a headset that’s comfortable to wear. And, for a mid-range headset, in that respect it succeeds with flying colours. The Razer Kraken Tournament Edition fits snug on the head, and the cushioned leatherette cups completely envelop your ears very easily. Apparently, these cushions are filled with a ‘cooling gel’ that’s meant to reduce heat buildup for extensive sessions, and I must admit I never felt them get too warm during use – though I’m not the sweatiest gamer, I must admit. 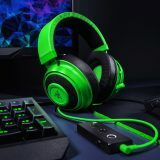 Razer have esports fans and budding competitors in mind with this headset, expecting long hours of gruelling use, and the headset feels like it could stand up to the test. The aluminium frame feels premium and solid, while still lightweight and giving the headset its needed flexibility. The headband has a thicker foam padding than on previous Kraken headsets, and while it’s still not very thick, the additional comfort is noticeable and appreciated. While I don’t wear glasses, the headset does have hidden ‘eyewear channels’ in its cushions to relieve pressure on user’s temples while wearing glasses, which is a nice touch. For the money, it definitely exceeds expectations, even down to the braided headphone cable. Those huge ear cups house 50mm drivers, which should deliver the big, punchy bass needed for the competitive FPS games Razer have no doubt engineered the Kraken Tournament Edition for. However, it’s here where the Kraken starts to fall down. I’ve been impressed in the past by Razer’s ManO’War headset, but the Kraken falls short in most applications. For general browsing, music and movie watching, it’s serviceable but not as powerful as I was hoping for. Audio can be indistinct and flat, even when messing around with the equalisers in Razer’s Synapse software, which have presets for different uses, none of which seemed quite ‘right’. That’s not to say they’re bad by any stretch, I was still able to listen to a few podcasts and my background glitchpop Spotify playlist just fine, but it’s just not quite what you’d be hoping for from a headset geared towards serious use. For games, the Kraken fares better with good positional audio that’s made better on PC with the included THX Spatial Audio USB box. 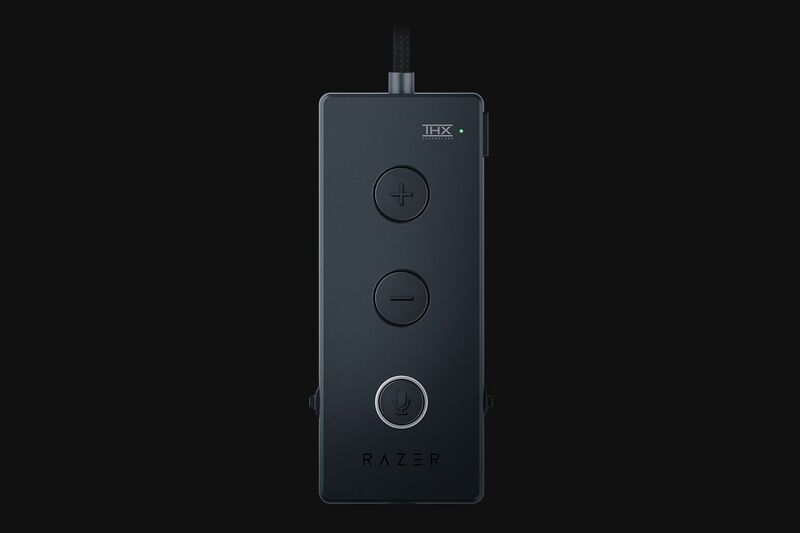 Not only does it feature volume controls, a bass booster feature with 17 levels of bass, and a game/chat balance dial but a dedicated switch to turn on and off the THX functionality. This is the key standout feature of the Kraken Tournament Edition, as it’s meant to enable THX’s own variation on a software-based surround sound solution using a regular stereo headset. And it does kind of work, enhancing your ability to detect the position of enemies in shooters and their obvious footsteps and gunfire, although for the subtler atmospheric effects in adventure games or RPGs it didn’t seem to do much apart from increase the volume of everything slightly. You can use the Synapse software to program the THX experience to an extent as well, moving each virtual speaker around you in a circle to see what works best for you. The included breakout box is handy, but appears to be a little buggy – or at least mine was – as after working fine on a couple of computers it would intermittently send out clicky static through to the headset instead of clean audio, which appears to have begun after Synapse froze and necessitated a reboot. After troubleshooting I’m still not entirely sure if the fault lies with the box or the Synapse software, but as of the time of this review it still has issues, although the headset itself with its 3.5mm cable works fine both on my PC and on other devices. Of course, on consoles you’ll need to go back to using the regular 3.5mm cable, where performance is similar to any mid-range pair of headphones. It’s decent, if a bit flat, but the comfort of the headset actually does mean more than you think when you’re relaxing on your couch. 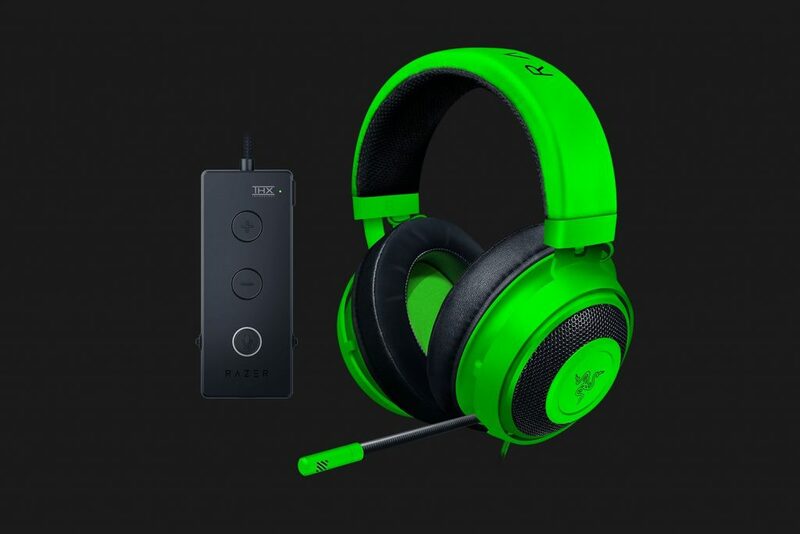 Playing through Red Dead Redemption II on Xbox One was actually a pretty soothing experience with these on, as while the sound was adequate the headphones themselves were also comfortable enough as they dissolved into the back of my mind, which is exactly what Razer seemed to be aiming for with this design. The Kraken’s retractable microphone performs well enough for game chat, with additional options for ambient noise reduction and vocal clarity, as well as manual controls for volume, sensitivity and sidetone. It’s all appreciated, however, it still sounds a little muffled and would probably not be suitable for streaming or filming purposes unless you had no other options. It’s hard to deny the Kraken Tournament Edition looks the part of a premium esports headset, and it even feels the part too, with great quality materials and an undeniably comfortable fit. However, the sound quality is disappointing for the price category it’s in, even with the THX Spatial Audio USB box that offers a decent, if not groundbreaking surround sound experience. For instance, at the same price-point and with the same target demographic, the Plantronics RIG 500 PRO Esports Edition lacks the USB peripheral but delivers a much more well-rounded audio experience for my money, and there are other competitive products from HyperX and Logitech worth looking into as well. 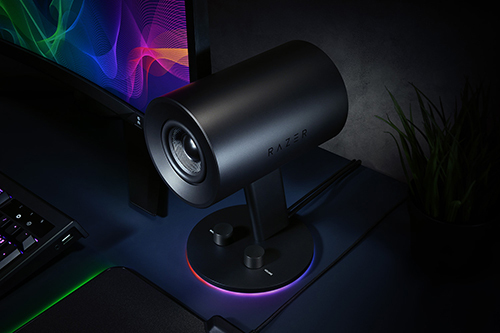 However, the Razer Kraken Tournament Edition does offer a comfortable, premium feel that is hard to match in its range, even if it falls short on the audio side.